I think it's well established that my supermarket willpower can be a bit lacking. Remember when I bought multiple boxes of coconut ice creams? And my UK supermarket purchases? I could list many other examples. Fortunately, there are some products that repel me so utterly that my willpower is refreshed and I am put off supermarkets altogether. It doesn't necessarily last long, but there really are some awful products out there. This post is about them! First up - flavoured raisins. Strawberry, blackcurrant and cola flavoured raisins to be precise. It pains me to note that the cola flavoured raisins are looking depleted on the shelf. I mean, how? why? cola and raisins? I don't understand. The fact that they need to advertise 'made with real fruit' kind of says it all. 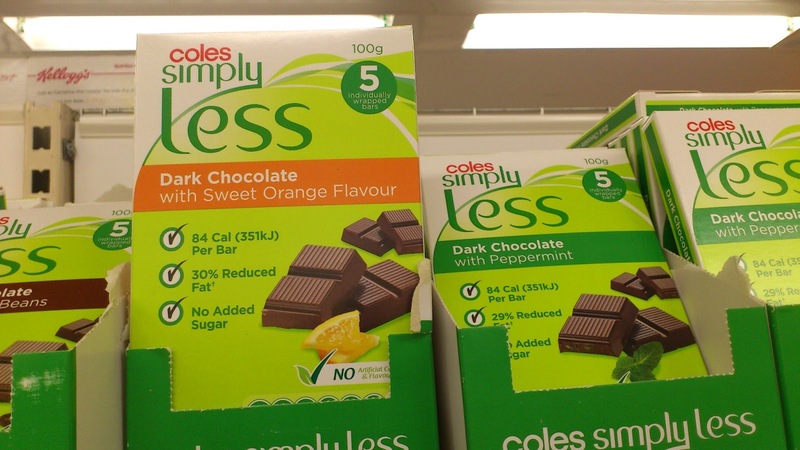 Second: Coles' new 'simply less' chocolate bars. I have to confess that I have tried one of these in the peppermint variety, and it wasn't bad. The packaging, though, is a complete turn off to me. When you read the ingredient list and spot things like apple juice in the orange version, it's also hard to think of it as real chocolate. Pretend chocolate, sure. A money making venture - definitely. 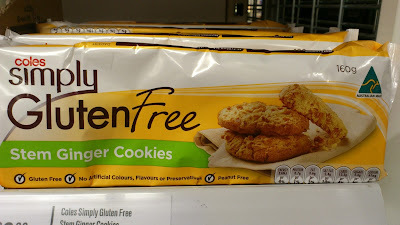 Staying with Coles, there are new stem ginger cookies in their gluten free range. This, in itself, isn't that bad (I understand some people need gluten free). The horror comes from Coles' previous, gluten containing stem ginger biscuits disappearing off the shelves some months ago. They were a favourite of Mr Bite, and he is not soothed by them returning without gluten. 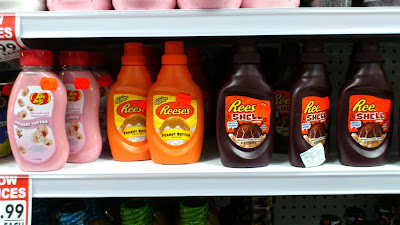 Amazingly, Red Dot stores (an Australian budget chain that sells all sorts of things; we sometimes use them for cards and wrapping paper) now sell Reese's pieces, Hershey's chocolate sauce, and Reese's topping sauces. I was quite tempted by these, but remain perplexed by what they are doing in Red Dot. 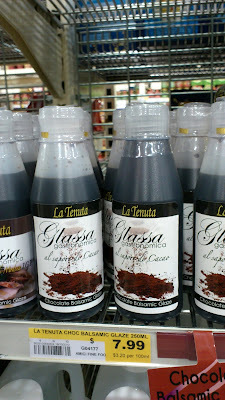 I'm also perplexed by chocolate balsamic glaze. I think I'd like it, but I'm not allowing myself to try. Similarly, I'm not allowing myself to buy these sugar-filled American cereals. I might, but if you look at the prices in the picture below, you'll understand why self-restraint wasn't difficult. 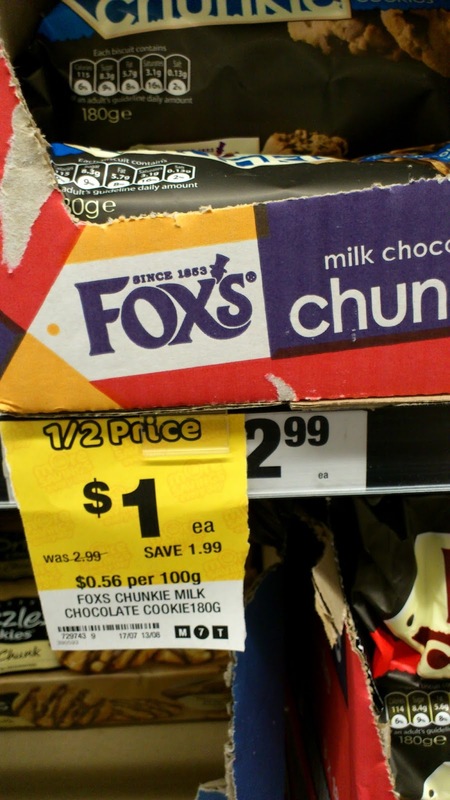 Last but not least - and focusing on labelling rather than product - can anyone spot what went wrong this half price label for Fox's cookies? What supermarket horrors have you seen recently? 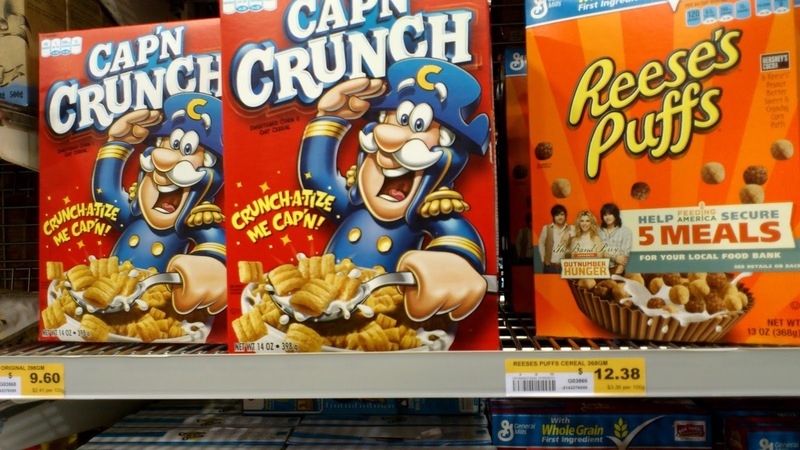 I confess to my mouth dropping open when I saw the price of the Cap'n Crunch. Having only ever seen it in American TV and movies, I'd be curious to try it (despite the sugar) - but really, nine dollars? Come on! I know! It's probably something like $2 is the US! Cola...raisins?! As if raisins aren't sweet enough, yeesh! And why is the cereal so expensive? Mike and I had a 20-minute session in the cereal isle the other day, contemplating if we should just buy a box because we had a mad craving, but I just couldn't bring myself to do it after reading the ingredient lists, no matter how much I loved the stuff as a kid. Though it was hard to turn away from Cinnamon Toast Crunch - that is by far the best one if you want the true junk food cereal experience. :) SO GOOD. Now I'm feeling weak willed again! I have had cinnamon something cereal in the UK and absolutely love it. It's packed full of sugar but still so good! The cereal is expensive just because it's imported from the US :-) We don't have the brands here as an Australian thing...our boxes are more like $3-$5. I do not like raisins to begin with. Adding flavor to them sounds awful!!!! Haha! First Sarah did a German supermarket snack post that she said was inspired by mine, and now you've moved into the posts about horrible supermarket things that you can't even bring yourself to buy. I'd like to think that my obsession with edible and non-edible processed snacks is TAKING OVER THE WORLD, one blog at a time. P.S. 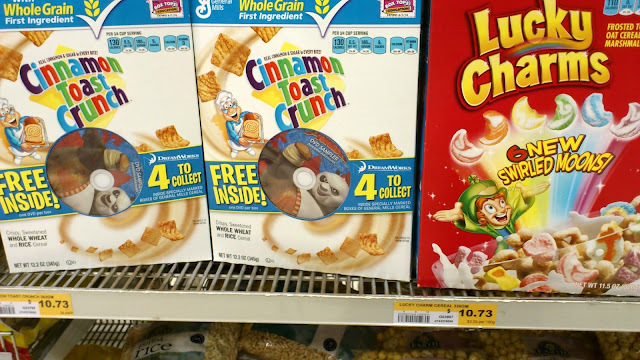 Cinnamon Toast Crunch and Lucky Charms are totally worth the splurge every now and again. Also, I literally have Reese's Puffs mixed with All Bran in a bowl before me right now. *Laughs* I think some things are so incredible or hard to believe that they just invite blogging. I do like your similar US themed posts though. 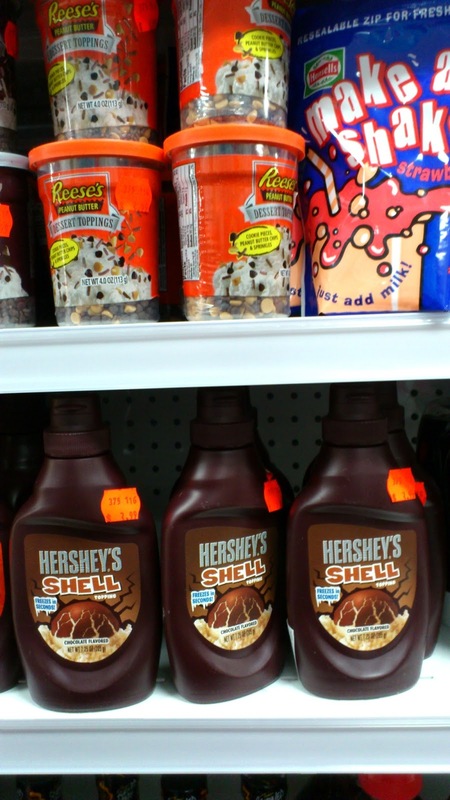 I am holding out for being able to buy sugary snack cereals at non imported prices :-) The UK has a similar cinnamon cereal that I love and I am definitely keen to get my hands on some Reese's one day, just to see what they're like. I love your approach to eating them with All Bran! Foods like flavoured raisins are silly and supermarkets are so busy chasing the new and quirky that you don't want to get attached to any product because they are just as likely to stop making it like those gingernuts - how heartless! Heartless indeed! Poor Mr B was most upset - I think it's proof they won't be returning in their original form now (although as you note, who knows what fads will come and go in the supermarket world). 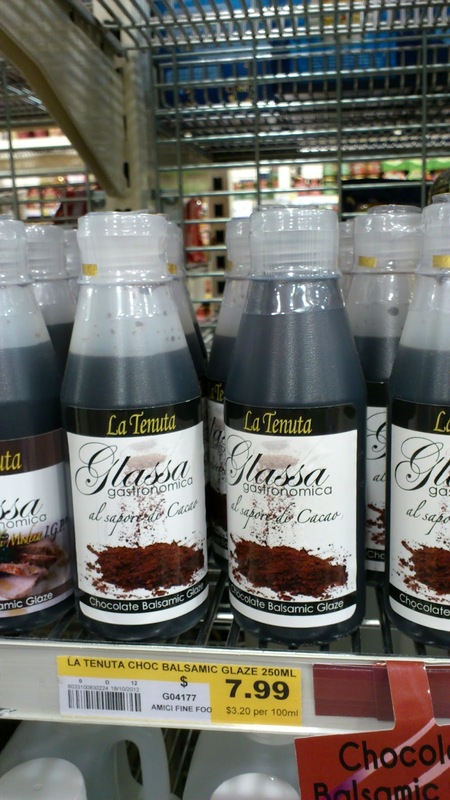 I had completely forgotten about your chocolate balsamic vinaigrette but now you've reminded me I remember how much I wanted to make it. Yours looked far more 'normal' as a dressing than the one in the bottle in the shop, which was thick and sort of gloopy. I'll definitely skip that one in favour of yours! 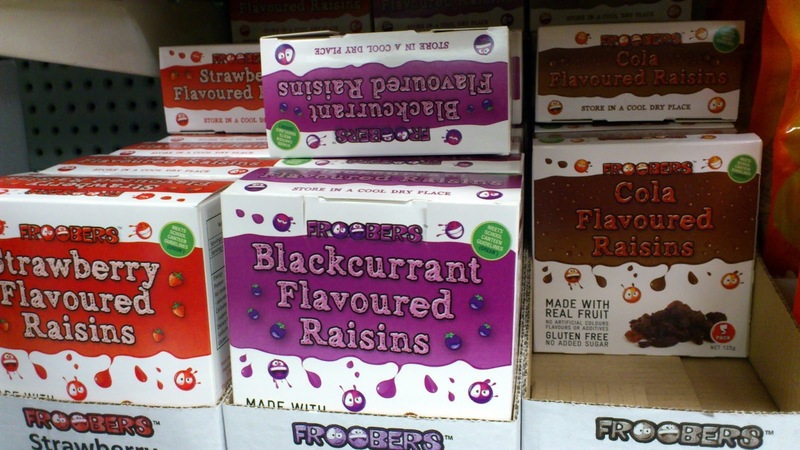 I had spotted the flavoured raisins in my supermarket and was horrified!!! How to make a simple honest snack food disgusting... made will real fruit BLAH! I know! It is so perplexing! I really really enjoy when bloggers keep it real. Loved the post and some of the ridiculous flavors were horrifying. When I first saw this post, I thought you had tried the cola flavoured raisins. I was ready to be horrified! I would be curious to hear from someone what they are like, but also, ew. Wow...some of these sound REALLY bad!! Impressively so! And I don't buy American cereals either. Or any cereal at all whatsoever. If I want to eat sugar, I can do it in a far less expensive way! Yes, spending a small fortune on sugar is particularly tough to justify when you think about how cheaply it can be obtained! I saw those cola raisins and cringed too they are just terrible!! Coles Simply Less range always makes me cringe too. They seem to really be trying to screw over suppliers. I know! The two big supermarkets are both terrible in that regard. oh gosh, just eww! I wish these disgusting items were just banned so more people could embrace 'real' food. My biggest eww item I saw recently (on an email though, not on the shelves)was 'chicken in a can' conveniently already cooked and squished into a 400ml regular shape can. I can just imagine the 'plonk' noise it makes when it comes out, covered in jelly. Gag. While we're on the chicken note, the other gag item I've actually seen is 'powdered egg' in a box. Why oh why wouldn't you just stick to wholesome fresh eggs? I have seen that chicken in a can! On shelves! It is absolutely revolting - I also can imagine how gross it would be. Ugh. Yes! Me too! The cola raisins! Who would buy them? Love your article! YIKES. That is A LOT of money to pay for a cereal that is not even good for you. And cola raisins? Whyyyyyy?? Thanks Gabby :-) They certainly made me laugh and I'm glad I'm not the only one to be bemused by the raisins! Where were the American cereals? Tyler loves Dr. Pepper and last year we bought Dr. Pepper BBQ sauce from a candy store in Hobart. RANDOM. It's still in our pantry. Surprise, Surprise! That is so funny! The American cereals were in a really big IGA...one of the 'super IGA' stores. They have all sorts of things other places don't! Towards the end of 2016 Coles have stopped selling the Stem Ginger Biscuits x 200 gram that came in a cardboard container inside of which was a cellophane wrapper and then a clear tray which the 8 or so biscuits were in. They cost $2 for a 200gram packet which works out at 1 cent per gram. They are still selling the gluten free version at $3 per 160 gram in a cellophane wrapper which works out at 1.875 cents per gram. Yes, nearly twice as much!!!! Come on Coles - start selling the normal Stem Ginger Biscuits again!!! Written complaints and phone calls have had no influence on Coles policy of selling only gluten free Stem Ginger biscuits!